This week I had the opportunity to review one of the best products for both parents and kids on the market. As a crazy busy work at home mom juggling two businesses, the idea of getting to do fun crafts with my kids always sounds good…. but the actual follow through to doing them is a bit of a different story. First its finding something to do, usually with the help of Pinterest, then driving to the craft store, hunting all of the supplies down, bringing them home, laying them out.. and nine times out of ten get frustrated because our craft ends up a hot mess. When I got an email asking me to review Kiwi Crate – a complete “crate” full of crafts and activities that is delivered straight to your door – I knew I had found a winner. Kiwi Crate was built out of a passion for hands-on fun that encourages creativity and curiosity in children. I had a deep appreciation for these projects, but often found that my greatest intentions fell short. It was tough to find the time to come up with engaging hands-on activities, let alone get the materials. Kiwi Crate was created to fulfill that wish and to celebrate kids’ natural creativity and curiosity. We want to make it fun, easy, and delightful to spend time building, exploring and creating together. Since its inception, the Kiwi Crate team has grown. We’ve added creative parents who dream up the projects, valued experts who review them, and a community of kid testers who keeps us on our toes and ensures the projects are fun and engaging. The Kiwi Crate arrived last week, and I kept it a secret until my friend Mary came over after lunch to just spend the afternoon hanging out, and the four of us girls spent the afternoon “crafting” at my dining room table. Now, I know these crafts are for kids – but Mary and I had just as much fun as the girls did. We received the “Secret Agent Kit” which had a “disguise” kit and “periscope kit,” as well as Midge’s favorite part – the Secret Message Set. 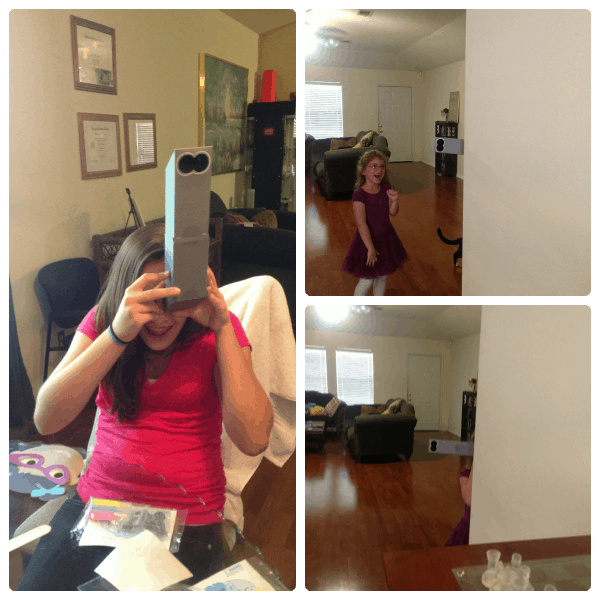 Mary and The Teen got to work on the periscope while Midge and I put together our disguises. The periscope was hysterical and there have been a few times since Saturday that I have seen it sneak around the corner to “spy” on me. The Secret Message Set was the highlight of the Kiwi Crate though, and Midge and I have had so much fun writing each other “secret” messages that only she and I can see. 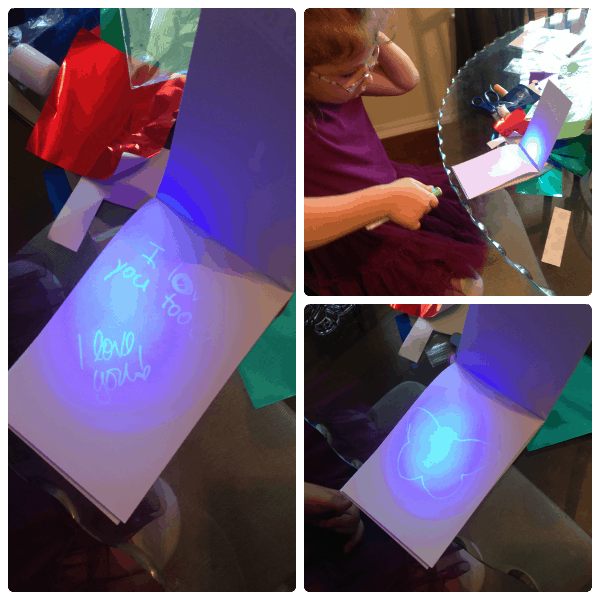 The Secret Message Set comes with a special “invisible ink” pen that has a special light on the end to make your secret messages show. 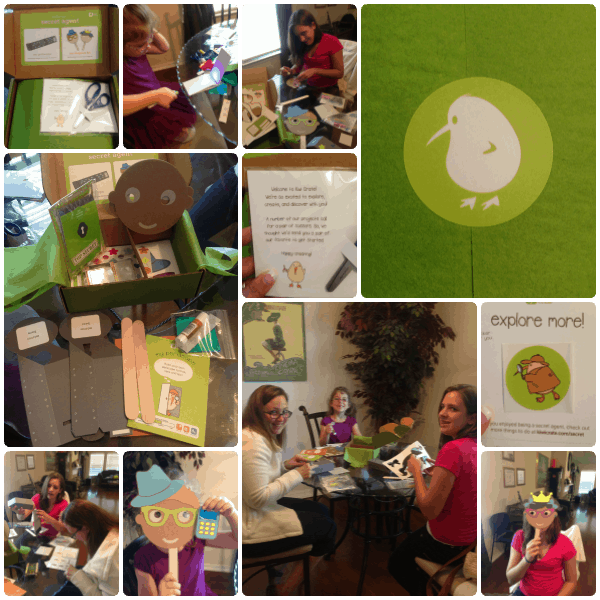 I loved how everything was included in the Kiwi Crate – all the way down to the kid safe scissors and glue stick. And I loved how even with as busy as I am, it was easy to just break out the box and have everything we needed to spend a couple hours just PLAYING. Check out their Sample Crates to get a peek at some of their past crates. You can check out Kiwi Crate and order a Single Crate for yourself, or even send as a gift. I love the idea of “gifting” this as I am always looking for something fun and unique to give as gifts – I hate when kids get duplicate stuff, don’t you?- so I am going to start sending these for Birthdays and Holidays instead of just shopping the department stores. It is a total win-win. There is even an option to subscribe and get a Kiwi Crate shipped to your door every single month – full of fun stuff to play with! Midge’s birthday is next week, and I haven’t told her yet… but I have signed her up for a year’s subscription already. It’s a gift we are both going to get to enjoy. PS – Also, check out the Kiwi Crate Facebook Page to enter to win a Dream Crafting Room, valued at $750! These Kiwi Crates always look so cute! I really need to sign up for my kiddos. We have a subscription & LOVE it! This is a great idea for a birthday gift! My kids love crafts and so do their friends. We love Kiwi Crate. My kids get so excited when that box arrives. Oh my goodness this is amazing! I would love to have something like that. Thanks for introducing me to this wonderful idea. My kids and I will be having a crafty summer that’s for sure.